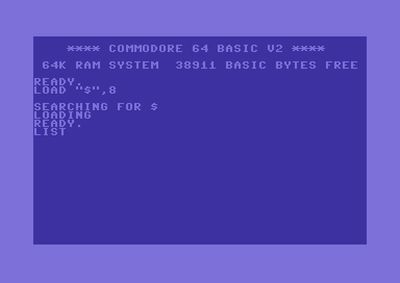 A short overview over the commands of the C64 can be found in the article C64-Commands ! Expansion port: Here you can plug in amongst others cartridges, as e.g the Final Cartridge III. Aerial socket: At this cinch port you can plug in an aerial cable, which has a cinch on the side of the C64 and on the other side the normal male aerial plug, which is plugged into the aerial port of the TV. To test, you can also use a normal aerial cable, which has an aerial plug on both sides. Don't forget to search for the right channel on the TV (channel 36). A/V jack: Here, special cables (amongst other monitor cable, video cable with scart adapter) can be plugged in to connect either to the monitor or to the TV. Alternatively a connection to the stereo equipment can be made over this port. Serial port: For peripheral devices as e.g. disk drive or printer. Cassette port: For connecting the datasette. User port: also offers possibilites to connect cartridges or interface cards. Important: All cables and cartridges need to be plugged in an out while the C64 is switched off! Check, if the power supply for the monitor / TV is ok. Check, if monitor / TV are switched on (can maybe be seen by lit LED). Check, if the cable connection to monitor / TV is correct. Check, if monitor / TV (channel 36) is adjusted correctly. Check, if brightness on the monitor / TV is set correctly. Check, if the power supply on the C64 is plugged in and the right voltage is on the socket. Check, when C64 is switched on, if red "Power LED" at the C64 is alight. Check the right (channel) settings of monitor / TV. 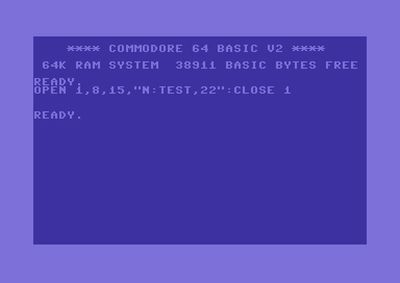 Check the correctness of the connecting cable between C64 and monitor or TV. Check, if cartridges are plugged in properly. Check, if contacts of cartridges or interfaces are free. Check, if joystick in control port 1 is set to 'automatic fire'. Check, if joystick in control port 2 is set to automatic fire. If yes, then switch it off or deconnect the joystick from port 2. If a datasette is plugged in, you can load a program from datasette with the command LOAD. Now the text PRESS PLAY ON TAPE appears on the screen and this is what you should do then. It is normal, that the screen is empty while the program is loaded! When the name of the program is shown, you need to press the Commodore key (lower left). You need a lot of patience, as the datasette is not the fastest possibility to safe data. With RUN a program is started. To save a program the command SAVE is used. A cassette is inside the datasette and it is loading. Check, if connection between datasette and C64 is ok. Check, if cassette / datasette is played correctly. The reel should turn and the tape counter should be moving. Check, if there is no tape jam in the datasette when playing the cassette. Check, if cassette / datasette contains computer data. You can check this by putting the cassette inside a cassette player and playing it. You should turn the volume down to preserve the speakers. If digital data is on the cassette, you will hear sharp beeps. Check, if datasette is wrongly adjusted. For this, there is a datasette adjustment program, amongst others software from the computer magazine INPUT 64. It can also happen, that the read/write head is dirty. Then you can clean the read/write head with a cleaning cassette. It can also happen, that the magnetisation faded over the years with older datasettes / cassettes, so that the medium can only be used partially or not at all and is destroyed. To load a program from a disk, we first have to know where it is. For this we let us show the contents of the diskette with LOAD "$",8 and LIST. Now we move to the desired position with the arrow keys and type LOAD..... ,8,1 there. The program is now loading. When the program is loaded, READY. appears again and we have to move the cursor to a free position (with the arrow keys) and enter RUN. In some cases it is not necessary to type the command RUN, as some games start by themselves. 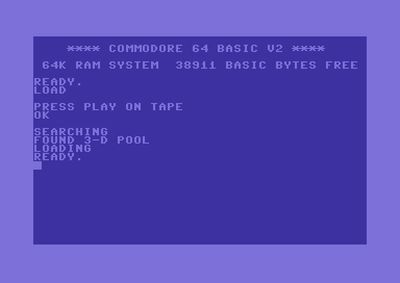 To make a (new) disk usable for a Commodore 64, it has to be formatted first. This is done by typing OPEN 1,8,15,"N:TEST,22":CLOSE 1. But be careful → With this the content of the disk is deleted! This all only works with a DD disk. A disk is in the drive. In the above-mentioned example, the floppy needs to have the basic configuration (without fast loader and standard device address of 8). Check, if connection between disk drive and C64 is ok. Check, if disk drive is switched on. Green LED should be lit. Check, if power supply of disk drive is ok. Check by the DIP switches, if the device address (see also 1541) is set to 8. If this cannot be changed, try other addresses from 9 to 11. Check, if the diskette lock mechanism is closed, i.e. either the locking bolt is in vertical position or the snap closure is snapped down. Check, if diskette has the right disk format (see, e.g. disk label). It can also happen, that the read/write head is dirty. Then you can clean the read/write head with a cleaning diskette. It can also happen, that the magnetisation faded over the years with older diskettes, so that the medium can only be used partially or not at all and is destroyed. This page was last modified on 18 April 2017, at 15:46. This page has been accessed 36,673 times.